Going on a jungle safari excites any adventure-loving tourist. Catching the sight of wild animals at their abode must be truly amazing. But, what about the citizens of the wild? Do they enjoy being stared at or even teased by humans, who trespass into their home on noisy vehicles? Obviously not. Animal lovers have been raising concern over jungle safaris for a host of reasons, one of them being the use of vehicles like Gypsy. They disturb the quiteness of the forest and cause pollution. Safaris have always come under criticism for contaminating the beautiful forests and disturbing the animals which belong there. Considering these issues seriously, the Tadoba Andhari National Park (TATR) has teamed up with Mahindra Electric for an eco-alternative to cars like Gypsy. So, from now on, Supro ECO-Rangers, the four-wheeler electric car, will be driven inside the tiger reserve. Mahesh Babu, the CEO of Mahindra Electric, tweeted: “Now the wild can breathe free. India’s first e-vehicle as Jungle safari van on e-Supro. Launched in Tadoba Tiger Reserve in Maharashtra. Congrats to creative Mahindra VAP team...” The official handle of Mahindra Electric also affirmed that wildlife safaris are all set to get greener and several other national parks have expressed interest in using Mahindra e-Supro EVs for noiseless, pollution-free safaris. 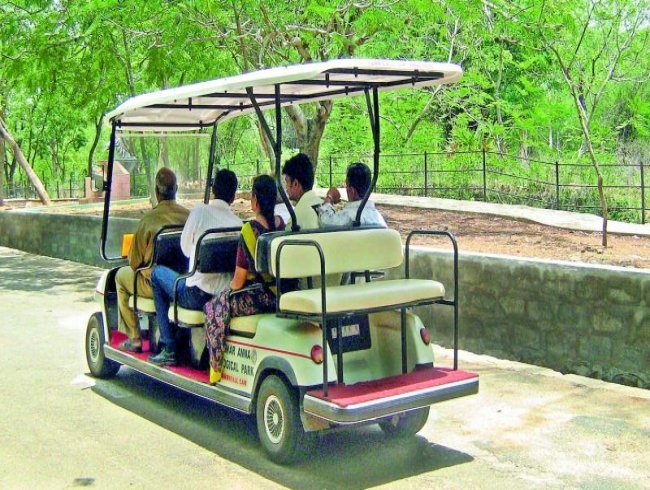 After its successful test drive in Tadoba, the Sariska Tiger Reserve in Alwar, Rajasthan, is set to implement electric cars for safari. Mahindra is conducting a pilot project in Ranthambore National Park as well. These cars have the capacity to accommodate six persons. Does using electric cars in safaris seem like a good move since they cause zero pollution and do not disturb the jungle? Shouldn’t it be implemented in all the reserves in the country? Since running cost is low for electric vehicles, will the safaris get more profitable? As these vehicles are silent, the chances of spotting animals are more. However, the battery capacity of these cars gets depleted after a certain amount of time. Will it trouble tourists as there isn’t any option to take the vehicle out once the battery depletes? Or, should jungle safaris be banned leaving the jungle to the animals? The use of vehicles like Gypsy for jungle safaris no doubt causes pollution. It is really a thoughtful step towards protecting the already depleting natural environment. Hope more and more animal reserves take this route to safeguard the natural habitat. But there is one concern that needs to be addressed, which is of the battery life of these vehicles. Generally, the battery life is not that good for electric vehicles and if the authorities make sure that the tourists get fully charged vehicle and portable charging points at convenient spots in the reserve, it will be a win-win situation for both the worlds to co-exist together. If there is a provision that tourists in various national parks in the country can use non-polluting e-vehicles, I would be all for it. However, I would back this idea only if the proposed vehicles could match the performance of Gypsy. By that I mean mileage, power and the ability to drive over rough terrain. This would take the safety argument out of the equation. I am against the banning of jungle safaris as tourists, in a way, provide protection to the animals. Most major poaching incidents take place in core zones and when tourists are not allowed into national parks. They also provide an economic incentive to local populations to support conservation efforts. We need to find a balance between ecology and economics; then only conservation will be viable in the long term for both humans and the wildlife. In principle, replacing petrol and diesel safari jeeps with emission-free electric vehicles within wildlife reserves is a good idea, provided that they perform satisfactorily. However, we need to go well beyond the petrol versus electric debate and seriously re-think the very model of vehicle-borne tourism, which causes so much disturbance and damage inside our fragile reserves. An even better solution might be to restrict tourists to specially designed, strategically located observation towers in the forest where they can sit quietly for an hour or two and observe wildlife in silence. This whole business of chattering tourists rushing around in vehicles, raising clouds of dust, and causing stress to animals needs to be replaced with a more peaceful approach to appreciating wildlife and communing with nature. Clearly, jungle safaris must be banned. But looking at how insensitive humans have been handling wildlife and greens, a ban is never practical. That way, electric cars are a boon because of their benefits. Those who run the safaris must ensure that the cars are charged up before the safari begins. It must be their responsibility. Accidents can happen anytime and anywhere and they are not under our control. It is high time we let wild animals move around freely in their habitat. Would we appreciate if aliens come and boss us around? Definitely not. Every living thing thrives and feels safe in their natural habitat. The least we greedy humans can do is let them move around peacefully without disturbing them of you want to witness their beauty in real. It’s a good initiative to keep a check on the impact of man-made inventions on natural habitats. Even though the introduction of electric cars for safaris will reduce the distress caused to the wildlife in national parks, it’s not the final solution. There should be well-defined boundaries in all these parks. Beyond the limit, the wild animals should have the right to live freely and not get disturbed by mankind. Wild animals also deserve freedom and technically, if we find it uneasy to see a leopard in a human settlement, the animals, too, have an equal right to feel offended and insecure when we trespass into their own space. I am personally not fond of safaris. To me, it disturbs the wildlife no matter how much precaution the officials take. The sound of vehicles is not tolerable. However, the whole idea of electric cars is good as it will not be very disturing. I am not sure whether more animals will be spotted, as most of them rest in the core of the jungle and humans are not allowed there anyway. As far as the battery life of electric car is concerned, precautions should be taken because there could be a panic situation causing unnecessary accidents if the battery depletes.